This week I’ve taken part in an experiment with the team at Findmypast, to live on a British ration allowance from the 1940s. While it’s not what I’d usually describe as family history research, it definitely helped me understand what my grandparents, great-grandparents and great-great-grandparents would have experienced during World War Two. I’ve actually really enjoyed the week – it’s been very achievable, even if the food did get a bit repetitive. I found that the key was to invest a bit of time at the start, making soups and casseroles that could last for a few days. I tried my hardest to ‘waste not, want not’. One evening, I used the zest from my one orange to create scones based on a recipe I’d found in The British Newspaper Archive. 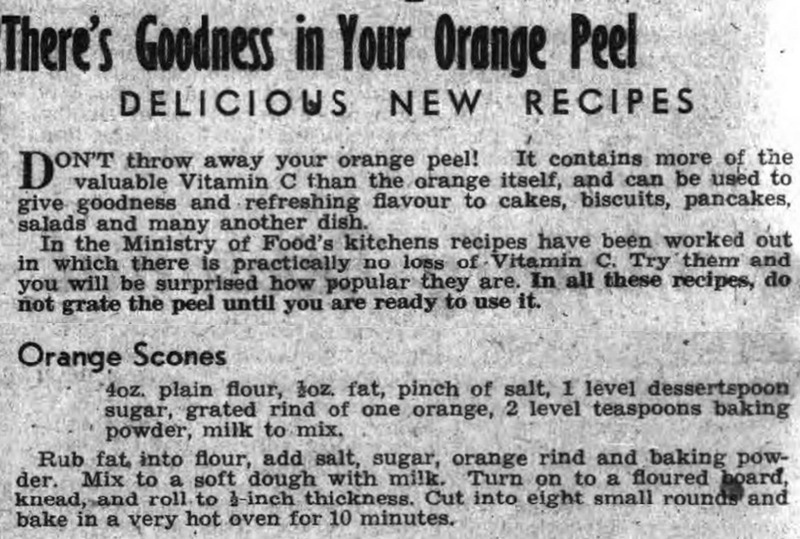 The recipe had been printed in the Lichfield Mercury on 25 February 1944. I would most certainly have thrown the peel away before, but the scones were lovely and really simple to make. I’ll definitely be using that recipe again. The meat, milk and fat allowances were pretty high, but I did struggle with the limited amount of cheese and fish. I’m a bit of a cheese addict, so 60g a week just wasn’t enough. It was also hard to live without tinned goods and out-of-season or imported fruit and vegetables. I’m very much looking forward to my first post-war banana on Monday! What could you eat during World War Two? This entry was posted on February 20, 2015 at 6:46 pm and is filed under Grandparents, Great-grandparents, great-great-grandparents, Second World War, Social history. You can follow any responses to this entry through the RSS 2.0 feed. You can leave a response, or trackback from your own site.